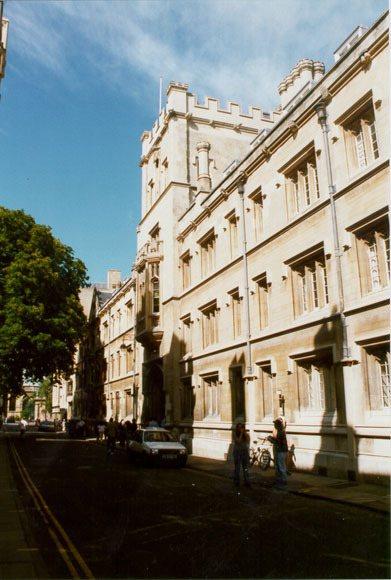 Tolkien came up to Oxford for Michaelmas term 1911. He had a scholarship from Exeter College to read Greats. He had rooms in college, in a building that no longer exists. Blackwell's Art and Poster shop is now on the site, but the rooms above are still Exeter students'. His room looked out onto Turl St. (The street in the photo). He got a second class in the Honour Moderations exam in his second year. As he was interested in languages, he was advised to change to English. He started English in Trinity term of 1913. In 1914 the First World War started. Tolkien finished his degree but joined the Officers Training Corps. In 1915 he completed his undergraduate course and joined the Lancashire Fusiliers and went to France in 1916 where he took part in the battle of the Somme. He was ill after that and spent the rest of the war in England, at first in Hospital, and then as a training officer.